There is a growing number of Government Departments and State Agencies, as well as body of academic work which uses the HP Deprivation Indices for the purpose of statistical and econometric modelling. Without exception, these studies have produced encouraging results and confirm the strong predictive and explanatory power of the HP Deprivation Indices. The following paragraphs briefly outline some of the key features of the HP Deprivation Indices and explain the reasons for their superior performance as a measure of prevailing social gradients and social need. The HP Deprivation Indices are unique in their use of confirmatory factor analysis to facilitate inter-temporal comparisons. The Pobal HP Deprivation Index (Haase and Pratschke, 2017) is the core index for the Republic of Ireland and covers the 18,488 small areas (SA) of the 2006, 2011 and 2016 Censuses. The latest Pobal HP Deprivation Index incorporating the 2016 census data is due to be launched by Pobal Maps in September 2017. The All-Island HP Deprivation Index (Haase, Pratschke & Gleeson, 2014) provides consistent deprivation scores for the whole of Ireland, based on the 2011 Census and covers 23,025 small areas North and South. The Longitudinal HP Deprivation Index (Haase & Pratschke, 2017) continues the ED level analysis over the six census waves 1991 – 2016. Whilst restricted to the level of 3,409 electoral divisions, this index facilitates the analysis of the effects of 20 years of economic boom, the subsequent collapse of the Celtic tiger and the recovery since 2011. The Longitudinal HP Deprivation Index will be released during September/October 2017. The following paragraphs highlight the key features of the HP Deprivation Indices which set them apart from other deprivation indices and make them particularly suitable for econometric and predictive modelling. Unlike other deprivation indices, which are generally based on Exploratory Factor Analysis (EFA), the HP Index uses Confirmatory Factor Analysis (CFA), which is a special case of the wider class of Structural Equation Models (SEM). In a CFA model, the researcher develops a structural model on theoretical grounds, specifying the required latent variables and constructing a set of indicator variables for each of these. Empirical data is then used to test whether the observations support the postulated model. This approach permits greater control over the concepts/dimensions included in the model by contrast with data-driven techniques like EFA. In Ireland, the importance of this approach lies in its capacity to achieve a balanced measure of deprivation across the urban-rural spectrum. All other published deprivation indices are subject to urban bias, to the extent that they fail to account for the nature of rural deprivation. Like other forms of factor analysis, CFA can be used to reduce multiple observations to a smaller number of underlying dimensions, avoiding the double-counting that typically results when a set of indicator variables is combined by summing the scores. There have been many debates about the number of indicators that should be used when building deprivation indices. Some authors use relatively few variables (4-5 indicators) whilst others prefer to use a large number (50-60 indicators). CFA provides an efficient way of deciding on the optimal number of indicators to be included. A model is first hypothesised and at least three indicator variables are specified for each latent variable, to ensure identification. If additional indicator variables are available, these can be included as long as the model has acceptable “fit”. In other words, additional indicators yield more precise deprivation measures only if their inclusion is consistent with the hypothesised factor model. For a deprivation index based on EFA, it makes no sense to ask whether the model “fits” the data, as all indicators load on all factors. For the same reason, the factors can be unstable and counter-intuitive. In a CFA model, by contrast, statistical tests and alternative fit indices provide a systematic way to assess whether a given theoretical model (i.e. our ideas about the key dimensions of deprivation and their relationship with a set of indicator variables) is consistent with the empirical evidence. Most importantly, in EFA the structure matrix varies with each new dataset, and cannot be fixed across multiple waves of census data. This means that EFA-based factor scores cannot be compared across successive waves. 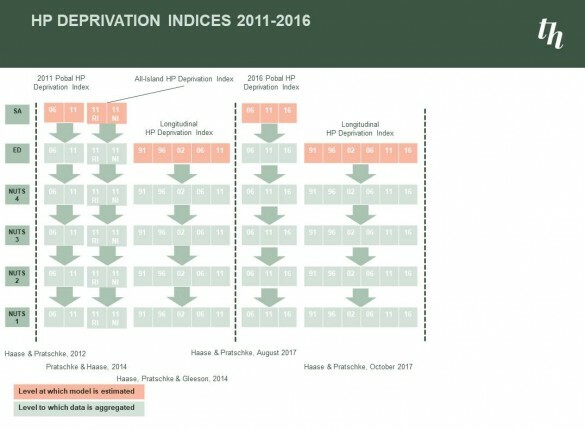 Because it relies on CFA, the HP Index provides deprivation scores with a stable factor structure and measurement scale which can be compared over time and across different jurisdictions. Because of the aforementioned instability of the factor structure, deprivation indices based on EFA typically rely on a ranking to compare results from one census wave to another. However, rankings contain much less information than scores, and typically over-emphasise small differences close to the mean. The HP Index, by contrast, maintains true comparability of actual deprivation scores from one census to another. It is the first deprivation index to achieve this goal at international level, and this is one of the most important advances pioneered by Haase and Pratschke in the construction of composite deprivation indices. As the measurement scale of the HP Index is invariant over successive census waves, it is possible to derive both absolute and relative deprivation scores. Absolute scores are fixed to a particular reference point (e.g. the 1991 census) and thus reveal the patterns of change over time. Relative deprivation scores are de-trended and focus on the relative distribution of affluence and deprivation at a single point in time. The HP Index is the only deprivation index at the international level which permits true comparison of deprivation scores over time. Unlike other deprivation indices (including, in particular, those which attempt to estimate the number of people in poverty in a given area), the HP Index is normally distributed with scores ranging from extreme affluence to extreme deprivation. This is of considerable importance when using the index to explore the social gradient of health outcomes, for example, or the health needs of a population. Close examination of the HP Index by the Central Statistics Office during early 2012 led the CSO to adopt this measure as the main stratification tool for the sample design of all future CSO household surveys (QNHS, EU-SILC, the forthcoming wealth survey and future general household survey). In a recent study, conducted by Haase and Pratschke for the CSO, the aforementioned statistical properties of the index were shown to be a major asset when conducting aggregate-level analyses. Internal work by the Health Intelligent Unit (HIU) has shown superior correlation between the HP Index and medical card status at small area level, when compared to other indices investigated, which is an important consideration when considering health care provision for an eligible population. The Small Area Population Statistics (SAPS) of the 2011 Census of Population has been published, for the first time, at the level of 18,488 Small Areas (SAs). In this new census geography, SAs are standardised in size, with a minimum of 50 households and a mean of just under 100, thus effectively providing street-level information on the Irish population. The move away from Electoral Divisions (EDs) – which could range in population from under 100 to over 32,000 – marks a major advance, particularly where a census-based deprivation index is used as a proxy for individual-level social position. Based on a special compilation of the 2006 SAPS data at the level of the new SAs, the HP Index is the only deprivation index in Ireland to have implemented the new small area census geography using the 2006 and 2011 census data on a consistent basis. Trutz passed away on 1 April 2018.
build a more equal and democratic society. access to data and reports.